Penske Automotive Group has added a new member to its board of directors who brings extensive experience in the premium/luxury auto sector. The group announced Friday that Wolfgang Durheimer has been elected to the company board of directors at its annual shareholders meeting. He was most recently chairman and chief executive officer of Bentley Motors. "We welcome Mr. Durheimer to the Penske Automotive Group board of directors and look forward to his guidance as we continue to grow our company," company chairman Roger Penske said in a news release. "As the auto industry continues to expand and evolve, his extensive experience in the premium/luxury auto sector will provide valuable insight to Penske Automotive Group." In addition to also previously serving as president of Bugatti Automobiles S.S.A. and Bugatti International S.A., Durheimer has held different positions within Volkswagen AG and its subsidiaries. 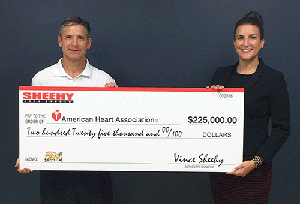 In other dealer group news, Sheehy Auto Stores also announced Friday that it has started raising awareness and funds for the benefit of the American Heart Association through its 21st Annual Sheehy 8000 sales event. This year’s group-wide event launched on Friday and will run through July. Sheehy Auto Stores's Vince Sheehy (left) and Michelle Nostheide, VP of marketing at the American Heart Association. Photo courtesy of Sheehy Auto Stores. Last year, the campaign raised $285,000 for the American Heart Association , according to Sheehy Auto Stores. "We are very proud to continue our support of the American Heart Association to raise awareness through community events and money for a great cause," Vince Sheehy, president of Sheehy Auto Stores said in a news release. "We know that education can help prevent this disease, and save lives, and we hope this campaign will continue to kick-start and reinforce healthy habits." Sheehy dealerships across Washington, D.C., Richmond, Va., and Baltimore, Md., will lead initiatives in support of this year’s Sheehy 8000. In addition to healthy cooking demonstrations, blood pressure screenings and fitness demonstrations, initiatives include CPR training for employees and the public. Additionally, Sheehy has also been a multi-year sponsor and active partner at the American Heart Association’s National Walking Day event held at the Springfield Town Center last month. "As we enter our fifth year as beneficiaries of the campaign, we are so grateful for the commitment and generosity of the Sheehy team and customers in helping to build healthier communities throughout Sheehy's regions," said Roxana Hoveyda, vice president of marketing at the American Heart Association. "With more than a million dollars donated to date, the impact on our mission has been considerable, and it is so exciting to be a part of this campaign." Over $40 million has been raised by Sheehy for community related and non-profit organizations, according to the group.